Many commenters to my post yesterday and to David’s original post asked about batter pace. Obviously batters can control the time between pitches (pace) by stepping out of the box often and by spending lots of time out of the box when they do (i.e. step out). Also, based on the results from yesterday’s post, the pace slows for hitters in two-strike counts and when there are runners on, who have a high strikeout rate (because they face more two-strike counts), and who bat with men on base. So I wanted to see how much variability there is in batter pace and take a quick look at the leader board. 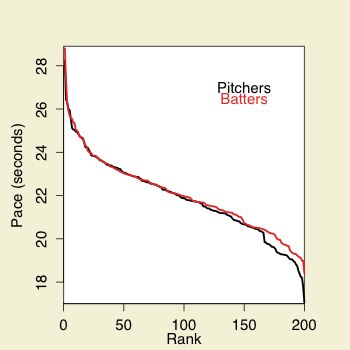 I was particularly interested in how the variation in batter pace compared to that in pitcher pace. Is the range as big as for pitchers? I took the 200 starting pitchers and 200 batters with the most pitches in 2010 and ranked them by pace (for batters I took just pitches seen against starters to make the comparison more direct). If the line were perfectly horizontal there would be no variability in pace (all batters or pitchers would have the same pace). So the closer to horizontal the less variability. Across the first 100 players the batter and pitcher lines are almost right on top of one another, but after that the pitchers fall off faster. So there is a little less variability in batters, and specifically there are not batters with as fast a pace as the fastest pitchers. So pitchers probably have more control at keeping the game going as fast as possible. But there is still considerable variability in batter pace. Here are the five fastest and slowest (numbers differ from the graph because the graph was just for batters against starters and this is for overall numbers). These names are probably not terribly surprising based on the results from yesterday: there is a slower pace on two-strike counts, when runners are on, and when relievers are pitching. The guys at the top of the walk a lot, often have plate appearances with runners on, and probably face more relievers than that average batter. The bottom includes guys who don’t walk much, and because of their team and place in the batting order rarely bat with players on base. We hoped you liked reading Batter Pace by Dave Allen! Shocking that Vlad isn’t on the bottom list. he swings at everything, so he gets into a lot of two strike counts, which means longer between pitches. also he comes up with men on base a lot, so again the pitcher slows down. so that evens out with his free swinging.